Israeli forces continued with systematic crimes, in the occupied Palestinian territory (oPt), for the week of 14 – 21 November, 2018. Israeli forces killed a fisherman and continued to use excessive force against unarmed civilians and peaceful protestors in the Gaza Strip. 113 civilians, including 25 children, 3 women, 3 journalists, and 6 paramedics were wounded. The Israeli forces continued to use lethal force against the participants in the peaceful protests organized within the activities of the “Great March of Return and Breaking the Siege” in the Gaza Strip, which witnessed for the 34th week in a row peaceful demonstrations along the eastern and northern Gaza Strip border area. During the reporting period, the Israeli forces killed a Palestinian fisherman and wounded 115 civilians, including 25 children, 3 women, 3 journalists and 6 paramedics. Meanwhile in the West Bank, Israeli forces 15 Palestinian civilians, including 2 children and a journalist. in the Gaza Strip, on 14 November 20188, Israeli forces killed Nawwaf al-‘Attar (23) when the Israeli soldiers opened fire at a group of fishermen near “Zikim” Military Base along the coastal border fence of the northern Gaza Strip. As a result, he was hit with a bullet to the pelvis and died. It should be mentioned that a group of amateur fishermen gathered for fishing in that area using nets that are known for catching mullets in their season which coincides this time of the year. As part of using excessive force against the peaceful protests along the Gaza Strip borders, during the reporting period, the Israeli forces wounded 113 civilians, including 25 children, 3 women, 3 journalists and 6 paramedics. As part of targeting the Palestinian fishermen in the sea, the Israeli forces continued to escalate their attacks against the Palestinian fishermen, indicating the on-going Israeli policy to target their livelihoods. During the reporting period in addition to the abovementioned incident that resulted in the killing of one fisherman, PCHR documented 6 other incidents. As part of targeting the border areas on 14 November 2018, Israeli forces stationed along the border fence between the Gaza Strip and Israel, northwest of Beit Lahia wounded Taher Matter (22) and arrested him. On 17 November 2018, Israeli soldiers stationed along the border fence between the Gaza Strip and Israel, east of al-Bureij, opened fire at a 28-year-old man when he was on Jakar Street. As a result, he was hit with a bullet to his lower limbs. On 18 November 2018, Israeli soldiers stationed along the border fence between the Gaza Strip and Israel opened fire at the agricultural lands, eat of Johr al-Deek village. However, no casualties were reported. In the West Bank, during the reporting period, Israeli forces wounded 15 Palestinian civilians, including 2 children and a journalist, in separate shooting incidents. The injury of one of those wounded was reported serious. During the reporting period, Israeli forces conducted at least 81 military incursions into Palestinian communities in the West Bank and 4 similar ones into Jerusalem and its suburbs. During those incursions, Israeli forces arrested at least 48 Palestinians, including 10 children and the PLC Member for the Change and Reform Bloc, Ahmed ‘Atoun (50), who was arrested from his house in al-Bireh. It should be mentioned that ‘Atoun was forcibly expelled him from his home in Jerusalem to Ramallah on 06 December 2011. Moreover, 22 other civilians were arrested, including 6 children and a woman, in occupied Jerusalem and its suburbs. In the Gaza Strip, Israeli forces conducted 4 limited incursions. The first one on 15 November 2018 in eastern al-Qarah village, northeast of Khan Younis in the southern Gaza Strip; the second was on 17 November 2018 near al-Nemer Gate, east of Deir al-Balah in the centre Gaza Strip; the third was on 19 November 2018 into the south of “Zikim” military base along the northern coastal borders, northwest of Beit Lahia in the northern Gaza Strip; and the fourth was on 20 November 2018 in eastern al-Maghazi in the central Gaza Strip. In all the mentioned incursions, they levelled and combed lands in the above-mentioned areas before redeploying along the border fence between the Gaza Strip and Israel. As part of the Israeli house demolitions and notices, on 19 November 2018, the Israeli municipality bulldozers levelled a plot of land belonging to Khaled al-Zeer in al-‘Abbasiyah neighbourhood in Silwan, south of Jerusalem’s Old City, claiming that the land is classifie within the green areas. It should be mentioned that the Israeli Nature and Antiquities Authorities and the muncpality attempt to seize this 16-dunum land, claiming there are antiquities in it in addition to their plans to establish national parks. 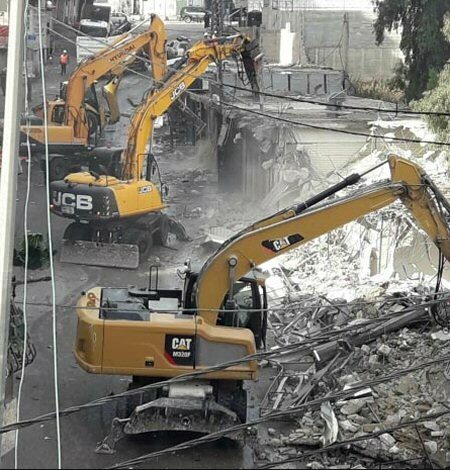 On the same day, Israeli municipality bulldozers demolished 2 residential rooms, a cafeteria, and a storehouse built of steel and shed cloth, 2 carwashes, and a grocery store in al-Mukaber Mount, south of occupied East Jerusalem, under the pretext of building without a license. They also demolished a mobile house donated by the EU in Qalendia village, north of the city. On 21 November 2018, Israeli municipality staff accompanied with dozens of vehicles and bulldozers moved into Sho’afat refugee camp, north of occupied East Jerusalem. They destroyed 19 shops, which support 60 families on the main street of the refugee camp under the pretext of building without a license. Eyewitnesses said that the bulldozers demolished 3 gas station and 16 shops; restaurants, a bakery, clothes stores, shoes stores, and barbershops.) The eyewitnesses added that the Israeli authorities fixed demolition notices to the stores in the late afternoon of the day before and gave the shops’ owners 12 hours to take out their goods. As part of the Israeli house demolitions and demolition notices, on 21 November 2018, Israeli forces demolished a 50-square-meter tin-roofed agricultural house built of cement and bricks in al-Marajem area, east of Douma village, south east of Nablus. The house belonged to Sari Dawabshah. They also demolished retaining walls of bricks “stone chains” established around the house under the pretext of unlicensed building in Area C.
As part of the Israeli settlers’ attacks against the Palestinians civilians and their property, during the reporting period, PCHR’s fieldworkers in the West Bank documented 4 incidents carried out by settlers. As a result of those attacks, a PRCS ambulance sustained severe damage in addition to another civilian car parked in front of its owner’s house. Khetam Khamis Hasan Shalouf (20), a volunteer paramedic at the Palestinian Ministry of Health, was hit with a rubber bullet to the right foot. Reham Rajab Jom’ah Abu Nasser (20), a volunteer paramedic at the Palestinian Ministry of Health, was hit with a rubber bullet o the head. Rabab Mesbah Mohammed Halawin (22), was hit with bruises to the left arm due to her falling down when the Israeli forces heavily fired tear gas canisters. Mohammed Ayman Mahmoud Saleh (25), a paramedic at the Military Medical Services, was hit with a tear gas canisters to the head. Gaza City: 21 civilians were wounded. Twelve two of them were hit with live bullets and their shrapnel and 4 were hit with rubber bullets. Central Gaza Strip: 7 civilians were wounded. Three of them were hit with live bullets and their shrapnel and 4 were hit with tear gas canisters. Mohammed Ziyad al-‘Abed Abu Foul (26), a paramedic at PRCS, was hit with a rubber bullet to the right shoulder. Mai Nasser Lubbad al-Lababdah (21), a paramedic at the Palestinian Ministry of Health was hit with a rubber bullet to the head. Rashed Sa’ed Khalil Rashid (48), a photojournalist at Associated Press (AP) News Agency, was hit with a live bullet to the left leg. Ahmed Khamis Jaser Hasaballah (24), a photojournalist at IMAGES LIVE Photo Agency, was hit with a rubber bullet to the left hand. Tal’at Osamah Tal’at Mushtaha (21), a freelance journalist, was hit with a rubber bullet to the left leg. At approximately 15:00 on the same Monday, Israeli soldiers stationed along the border fence between the Gaza Strip and Israel, east of al-Buraij opened fire at a group of Palestinian children and youngsters, who approached the border fence. As a result, a 15-year-old child, form al-Buraij, was hit with a live bullet to the right foot. At approximately 13:30 on Friday afternoon, 16 November 2018, a group of Palestinian civilians moved from the center of Kufor Qadoum village, northeast of Qalqiliyah, into the eastern entrance to the village, which has been closed for 15 years in favor of the entrance to “Kedumim” settlement established on the village lands. The protestors chanted national slogans demanding end of occupation and condemning the Israeli forces’ crimes against Palestinian protestors along the eastern border of the Gaza Strip within “The Great March of Return and Breaking the Siege” activities. The protestors threw stones at Israeli forces stationed behind sand barriers. The Israeli forces fired rubber bullets, sound bombs and tear gas canisters at them. As a result, a 40-year-old civilian was hit with a rubber bullet to the chest and a 22-year-old civilian was hit with a rubber bullet to the chin. Following the Friday prayer on 09 November 2018, dozens of Palestinian civilians and international human rights defenders gathered on agricultural lands of “al-Resan” Mount area, west of Ras Karkar village, west of Ramallah in protest against the Israeli settlers’ attempt to seize and confiscate the land. When the civilians arrived at the abovementioned area, the Israeli soldiers fired live and rubber bullets, sound bombs and tear gas canisters at the protestors. As a result, a 19-year-old civilian was hit with a rubber bullet to the foot and a 21-year-old civilian was hit with a rubber bullet to the foot. At approximately 09:30 on Thursday, 15 November 2018, Israeli forces raided a house belonging to ‘Ali Ahmed Abu Jamal in Abu Jamal neighborhood in al-Mokaber Mount area, south of occupied East Jerusalem. The family sai that the Israeli forces raided and searched the house and then arrested ‘Ali and his wife Yosra along with their children Mohamed, Mahmoud, Hanaa, Amani; his brothers Jamal and Yousef; and his nephew Anwar. On Thursday evening, all of them were released. Storming the house came following the Israeli forces’ declaration about a stabbing attack carried out by ‘Ali’s son, ‘Abed al-Rahman (17), in ” ‘Oz” Police Station in “Armon Hantsif” settlement established on al-Mokaber Mount lands at approximately 22:40 the day before. As a result, the Israeli police opened fire and hit him with several live bullets. After that, he was taken to Sha’ari Tsediq Hospital in West Jerusalem to receive medical treatment. Moreover, the family doubted the Israeli forces’ claims about their son’s raiding the ‘Oz Police Station and carrying out a stabbing attack there. The family said that the police station is higly fortified that no one could raid it and is surrounded by several cameras which record any move near the police station. the family also said that the police has not acquainted them with ‘Abed al-Rahman’s heath condition, but the lawyer Razan al-Ja’bah informed them that ‘Abed al-Rahman is staying in the Intensive Care Unit (ICU) at the hospital, where she visited him. The family pointed out that the lawyer told them that ‘Abdel Rahman is under very intensive security by the Israeli police officers staying at the ICU door and inside it. The lawyer said that the Israeli police did not give her any information about ‘Abed al-Raham’s heath condition, place of his injury or reason behind his unconsciousness, pointing out that he is connected to many machines and suffers a very serious health condition. At approximately 14:00 on Tuesday, 20 November 2018, the Israeli forces summoned ‘Ali Ahmed Abu Jamal to al-Maskobiyia Police Station and informed him that his son ‘Abed al-Rahman succumbed to his wounds. It should be noted that ‘Abed al-Rahman was a 12th grade student in al-Mokaber Mount High School. At approximately 12:30 on Saturday, 17 November 2018, Israeli forces stationed at Qalandia military checkpoint, north of occupied East Jerusalem, suppressed a peaceful demonstration, where dozens of international and Palestinian journalists participated within the activities of media conference titled: “journalists under fire”. According to PCHR’s investigations and eyewitnesses statement, at approximately 11:00 on Saturday, dozens of international and Palestinian journalists gathered at the western entrance to Qalandia refugee camp in order to participate in a demonstration organized by the Palestinian Journalists Syndicate and titled as: ” Entering Jerusalem through Qalandia Checkpoint” and it was an activity of the international press conference ” Journalists under fire”, which was held in Ramallah. Few hours later, the journalists participated in the demonstration headed towards Qalandia checkpoint wearing the logo of the International Federation of Journalists, raising the international press cards, and calling for the freedom of journalists’ moving. The demonstration included around 21 journalists from the International Federation of Journalists and the Arab Federation of Journalists, who participate in the press conference. When they approached the checkpoint, the Israeli forces fired sound bombs and tear gas canisters at them. As a result, many journalists suffered tear gas inhalation. Some of those journalists were identified as Adriana, member of the Executive Committee of the International Federation of Colombia; Manal Khamis, member of the General Secretariat of the Palestinian Journalists Syndicate; and Nasser Abu Baker, Head of the Palestinian Journalists Syndicate, who sustained tear gas canister shrapnel wounds to right shoulder. Head of the International Federation of Journalists, Felib Lourth, said to media that the demonstration was fully peaceful and the Israeli forces attacked it. He added that: ” I has been working in press since many years and I did not expose to such tear gas canisters that fired by the Israeli forces at us, they could disperse us from the area. He added: ” they afraid of press and this a clear message from the Israeli forces to the whole world that they did not care to the freedom of press. At approximately 02:00 on Sunday, 18 November 2018, Israeli forces moved into Silwan village, south of occupied East Jerusalem. They raided and searched houses, from which they arrested 2 civilians, including a child. The arrested civilians were identified as Ameer ‘Abdullah Abu Subaieh (17) and Tareq Khaled ‘Odah (22). At approximately 04:00 on Monday, 19 November 2018, Israeli forces moved into Qalandia refugee camp, north of occupied East Jerusalem. They raided and searched houses, from which they arrested ‘Ammar Yaser Mutair (26) and Basem Ibrahim Zayid (19). At approximately 03:00 on Tuesday, 20 November 2018, Israeli forces moved into al-‘Issawiyia village, northeast of occupied E ast Jerusalem. They raided and searched houses, from which they arrested 5 civilians, including a child. The arrested civilians were identified as Saleh Bader Abu ‘Asab (18), Mahmoud Sa’di al-Rajbi (19), Mahmoud Mar’I Derbas (18), Waseem Eyad Dari (16), and Hussain Yousef Jamjoum (20). At approximately 07:00 on Monday, 19 November 2018, Israeli vehicles leveled a plot of land belonging to Khalid al-Zair in al-‘Abasiyia neighborhood in Silwan village, south of occupied East Jerusalem’s Old City, under the pretext of “Green Land.” Khalid said that the Israeli Municipality staff and vehicles accompanied with the Israeli police raided his land in al-‘Abasiyia neighborhood and leveled parts of it. He said that the Israeli authorities have attempted to seize his land for years and imposed tens of fines on him because of establishing many facilities and parking vehicles in his land. He pointed out that the Israeli authorities demolished those facilities 3 times under the pretext of non-licensing. It should be noted that Israeli authorities of Nature and Antiquities along with the Israeli Municipality attempt to seize Khalid’s 16-dunum land under the pretext that there are antiquities in the area in addition to planning to build national parks. At approximately 10:00 on Monday, the Israeli Municipality bulldozers demolished 2 residential rooms and commercial facilities in al-Mokaber Mount area, south of occupied East Jerusalem, under the pretext of non-licensing. In al-Sal’ah neighborhood, the Israeli bulldozers demolished a canteen for sandwiches, a store for iron and sheds belonging to Eyad Ja’afrah. The demolished facilities were built on an area of 70 square meters. In al-‘Abidat neighborhood, the Israeli Municipality bulldozers demolished a car wash and a grocery belonging to Khader ‘Obidat and another car wash belonging to al-Mohtaseb Family. The Israeli bulldozers also demolished 2 residential rooms and offices built on an area of 80 square meters and stores for tools built on an area of 45 square meters. All of them belong to Mohamed ‘Ali Sorri. He said that the Israeli Municipality vehicles demolished two 80-sqaure- meter rooms used as a shelter for employees and built 5 years ago. He added that the Israeli Municipality vehicles also demolished a concrete floor built 30 years ago and a barrack used as store for tools. He clarified that he paid a fine estimated at NIS 100.000 for the Israeli Municipality and a decision was issued by the court to stop the demolition, but he was surprised that the Israeli bulldozers carried out the demolition without caring to the court decision. In the same context, the Israeli Municipality and Interior Ministry vehicles demolished a mobile dwelling donated by the European Union (EU) in Qalandia village, north of occupied East Jerusalem. The owner of the house dwelling, ‘Ali Mutair, said that he was surprised that the Israeli forces surrounded his house as a prelude to demolish it without a prior warning. He clarified that he received a notice from the Israeli forces 4 days ago and the notice gave him 15 days to appeal the decision, but the vehicles of the Israeli Interior Ministry did not wait and demolished the house. He added that the Israeli Municipality bulldozers demolished his house 7 months ago and the EU granted him the mobile dwelling to live in it with his family. The 45-sqaure-meter dwelling included 3 rooms and ‘Ali and with his wife and their children were living in it 2 months ago. He pointed out that he could not rent a house, so he will live in his father house. On Wednesday morning, 21 November 2018, Israeli municipality staffs accompanied with tens of vehicles and bulldozers moved into Sho’afat refugee camp, north of Jerusalem. They demolished 19 commercial facilities on the main street of the camp, under the pretext of unlicensed building. According to PCHR’s investigations, at approximately 08:00 on the abovementioned day, hundreds of Israeli soldiers moved into Sho’afat refugee camp and deployed along the main street, closing off the checkpoint and preventing vehicles and buses from entering and leaving the camp via “Ras al-Khamis” gate. The soldiers also closed the vicinity of the rubble with iron barriers and red tapes, obstructing life in the refugee camp all day long due to the demolition. Eyewitnesses said that the bulldozers demolished 3 gas stations and 16 shops (restaurants, a bakery, clothes stores, shoes stores, and barbershops) that support 60 families. The eyewitnesses added that the Israeli authorities fixed demolition notices to the stores in the late afternoon of the day before and gave the shops’ owners 12 hours to take out their goods. Next day morning, the Israeli forces in large number accompanied with bulldozers starting demolishing all the shops and then unloaded the rubble in special trucks. It should be noted that the Israeli forces arrested 4 children from the camp during the demolition and referred them to “‘Atarout” police station, north of Jerusalem. Those arrested were identified as Mohammed ‘Issam al-Qawasmi (16), Ra’ed al-Rajabi (15); Mahmoud Daghmah (15); and Ahmed Hadib (16). On Sunday, 18 November 2018, the Israeli Supreme Court rejected the request of al-Sabbagh Family to allow them to appeal a decision to expel the family from their house in ” Karem al-Ja’ouni” area in al-Shaiekh Jarrah neighborhood, north of occupied East Jerusalem’s Old City. The court refused to discuss the ownership of the building, where the family live, and refused the appeal because the statute of limitations had expired. This means that around 40 members of the family, including 30 children and an infant, will forcibly leave their houses. It should be noted that al-Sabbgh family building is located on a plot of land, which is targeted by the Israeli authorities and includes 29 buildings sheltering over 100 families since 1950s. The Israeli authorities seek to evacuate it as a prelude to build a settlement neighborhood in the largest displacement operation witnessed by occupied Jerusalem since its occupation in 1967. Thus, rejecting the appeal would affect tens of Palestinian families who are threatened of expulsion in “Karm al-Ja’ouni” area, including al-Sabbagh family, who filed the appeal. Al-Sabbagh family has lived in al-Sheikh Jarrah neighborhood since 1956 and their suffering started in 2008 with the expulsion measures. During that time, lawyers of the affected families; Sami Irashayed and Saleh Abu Hussein checked the Land registration file and found flaws in it. Thus, they filed a suitcase before the District Court asking to open discussion about the ownership of the land. Lawyer Sami Irshayed said “they have adequate evidence proving that this land does not belong to settlement associations saying that the Israeli claims are based on Turkish birth certificates, but when you look into the registration file, you see no birth certificates. Moreover, the Deputy Land Registrar wrote months before the registration of the land that the alleged birth certificates were not presented to him. Despite all of this, within only one month the land was registered under the name of the associations.” Moreover, Lawyer Irshayed traveled to the Ottoman Archive in Istanbul and checked the numbers of birth certificates which were mentioned in the registration file to find out that there were no certificates with such numbers. He added that he found certificates relevant to lands owned by Jews in al-Sheikh Jarrah but do not match with the place description and boundaries of the land. The District Court refused to hear the evidence on the basis that the statute of limitations has expired as the land was registered many years ago. The lawyer headed to the Supreme Court and asked for examination of the evidence, but the Court after short discussion decided to reject Sabbagh’s appeal and approve the District Court’s decision on the statute of limitations. At approximately 11:00 on Monday, 19 November 2018, Israeli soldiers attacked the family of Palestinian farmer ‘Ali Ahmed ‘Isaa Ba’rah, from al-Khadir village, south of Bethlehem, while he was working in his land, which is adjacent to ” Sdeh Bouaz” settlement, south of the city. Ahmed Salah, Coordinator of the Committee against the Wall and Settlements in al-Khader village, said that Israeli military forces raided ‘Ali land and deported him, his family, and other activists who came to help him, under the pretext of being within a military banned area. Ahmed Salah clarified that this land is targeted the Israeli settlers have desire to have this land, pointing out that they uprooted around 400 olive seedlings a year ago. Salah added that the Israeli forces prevented the family from entering the land and this proves their ambitions to seize the land and annex it to a settlement outpost. At approximately 08:30 on Wednesday, 21 November 2018, Israeli forces accompanied with a bulldozer and a jeep belonging to the construction and organization department in the Civil Administration moved into al-Marajem area, east of Madma village, southeast of Nablus. They demolished a 50-square-meter agricultural house built of bricks and cement and roofed with tin plates. They also demolished retaining walls “stone chains” established around the house and belonging to Sari ‘Omer Sari Dawabshah from the abovementioned village under the pretext of unlicensed building in Area C.
At approximately 03:00 on Wednesday, 14 November 2018, a group of Israeli settlers, from ” Yatizhar” settlement established on ‘Oreef village lands, south of Nablus, sneaked into the village outskirts from the eastern side. The settlers set fire to a Palestinian car belonging to Mahmoud Mahfouz Mahmoud Shehadah. The car was parking in the house yard and the settlers was managed to sneak and poured a flammable material on the car before setting fire to it. They also wrote slogans on the house wall. The car was full of fire before residents could extinguish the flames. On Saturday, 17 November 2018, Israeli settlers threw stones at Palestinian civilians while harvesting olive trees, east of Hebron. Rashid al-Zarou al-Tamimi said that while he and his family were harvesting olive trees from their land in al-Jales Mount, east of the city, he were surprised with a number of settlers, from ” Khafat Jal” settlement, approached them and threw stones at them, casing fear among children. On Saturday, a group of Israeli settlers attacked a PRCS ambulance on al-Shuhada closed street in the center of Hebron with stones and smashed the ambulance windshield. The ambulance officer, ‘Eid Abu Monshar, said that at approximately 21:00, the ambulance Services received a phone call, informing them about taking a patient from Tal al-Ramida to one of the village hospitals. After coordinating for the entry of the ambulance via the Palestinian Liaison, the settlers directly attacked them while passing by al-Shuhadah Street. Mohamed al-Zaghi, Spokesperson of the Youth Group against Settlement, said that while he was in a night field visit with 2 foreign solidarity activists, they noticed an ambulance passing on al-Shuhahdah Street and around 15 Israeli settlers attacked the ambulance with stones. At approximately 06:00 on Monday, 19 November 2018, a group of Israeli settlers. From Yatizhar” settlement, south of Nablus, sneaked into the outskirts of ‘Oreef village from the eastern side. They threw stones at Palestinian civilians’ houses. Meanwhile, a group of Palestinian young men gathered and confronted the settlers. No injuries were reported among the Palestinian civilians.